« Can Spring Be Far Behind? With the temperature hovering around 60° today, it was easy to feel like Spring is back. Unfortunately, the area climate is tempered by the economic climate which, these days, makes everything feel more like the storm illustrated above. Living in southeastern Michigan, the economy … more specifically its horrendous descent in the past year … is particularly disturbing to the psyche of everyone caught up in it. 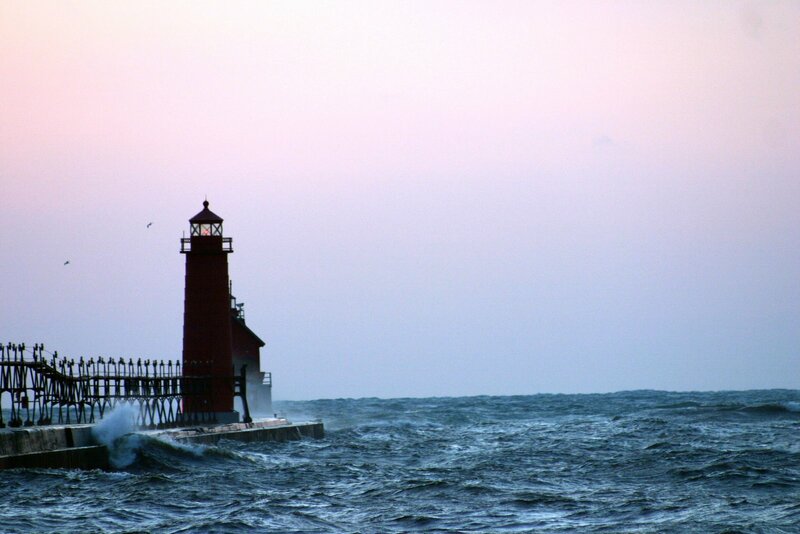 The picture above is the lighthouse at the mouth of the Grand River, right where it empties into Lake Michigan. The shot doesn’t really show the gale wind that was blowing. It took weeks to get all the sand out of my lens from the fierce winds coming in off the lake that day, but the shot, I think, was worth it. It’s kind of like what’s happening with the economy. This is a rough storm with rough winds for everyone, but the experience – hopefully – will make us stronger in the end. This entry was posted on April 2, 2009 at 5:01 pm and is filed under Lifestyle, Non-Fiction Writing. You can follow any responses to this entry through the RSS 2.0 feed. You can leave a response, or trackback from your own site.